'There will come a time when gifted poets will write verse in praise of the Grand Duchess, her noble soul, her radiant feats, not only ascetic feats but also feats of love and mercy. Her beautiful and noble deeds, her sacrifice, a sacrifice made on the altar of love, will never be erased from the memory of human nobility and mankind will bless her as great, for she was wedded to love'. Abbot Seraphim, The Martyrs of Christian Duty, P.12, Beijing, 1920. 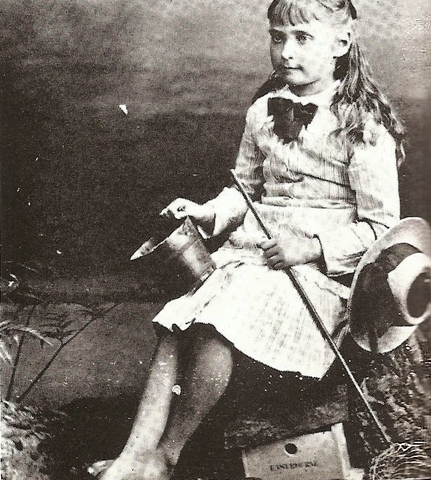 The future Grand Duchess and New Martyr Elizabeth was born in 1864, the second of seven children. She was the daughter of Ludwig IV, Grand-Duke of Hessen-Darmstadt, and Princess Alice, daughter of Queen Victoria. Since she was half English, Ella, as she was called, often visited Queen Victoria in England, becoming her favourite granddaughter. Here she stayed at Windsor Castle, Osborne House and also at Balmoral in Scotland. There survives an extensive correspondence in English with her beloved grandmother in 'dear England'. Educated in a traditional English way by an English governess, Ella's mother instilled in her a Christian spirit, according to the principle of 'love thy neighbour'. As her earliest biographer, Metropolitan Anastasy, wrote: 'An English imprint undoubtedly lay on all her tastes and habits; the English language was closer to her than her native German'. When Princess Alice tragically died of diptheria in 1878, aged only 35, her last will was that her coffin be draped with the Union Jack. In 1884, aged nineteen, Elizabeth married the Grand Duke Sergei, the son of Emperor Alexander II of Russia in two ceremonies, one Orthodox, the other Protestant. Deeply in love with her husband, she began to study the Russian people and culture and above all the Orthodox Faith which had moulded them. She long hesitated to join the Orthodox Church, for fear of upsetting her immediate family who were Lutherans. Then after two years of intense study and prayer, of her own free will she finally decided to become an Orthodox Christian by conviction. She was duly received by chrismation into the Orthodox Church on the Saturday before Palm Sunday 1891. In this decision only her grandmother, Queen Victoria, wrote her a letter full of encouragement and support, for which Elizabeth replied thanking her for her goodness and motherly love. Elizabeth described this event in one of her many letters in English, dated 5 January 1891, to the future Emperor Nicholas II. Here she described how she had long 'continued in outward forms to be a Protestant when my soul already belonged to the Orthodox belief'. Also in 1891 her deeply religious husband was appointed Governor of Moscow by Emperor Alexander III. In 1894 her younger sister, Alexandra, married the future Russian Emperor, Nicholas II, with the ardent encouragement of Elizabeth. The Grand Duchess devoted herself to charitable work, continually caring for the well-being of the Russian Orthodox people, especially during the Russo-Japanese War of 1904-5. However, on 4 February 1905, while she was leaving her home to do charitable work, she heard a terrible explosion. Hurrying towards where the explosion had come from, she saw a soldier stretching his greatcoat over some of the remains of her husband. He had just been been killed by a terrorist bomb and his body had literally been blown apart. Profoundly shocked, Elizabeth, now a childless widow, still had the moral strength to visit the arrested assassin of her husband, a certain Kaliayev, in prison. She hoped to soften his heart through her example of forgiveness. The murderer told her that he had on several occasions wanted to kill her husband, but he had not been able to bring himself to touch him because she had been with him. The Grand Duchess gave a book of Gospels and an icon to the man, hoping against hope that he would repent before the end. The shock of the murder brought about a great change to Elizabeth. She withdrew from social life and adopted a vegetarian diet. The wound in her soul was such that she raised her eyes to look at eternity. Closely following advice from bishops of the Holy Synod of the Russian Church, she devoted her life to the Orthodox way of life. She bought a house and a large piece of land in Moscow and established a community, devoted to St Martha and St Mary, carrying out the tasks of deaconesses, as in the early Orthodox Church. She intended this community to become like the home of St Lazarus, which had so often been visited by Christ. Several women from all classes joined the Grand Duchess to devote their lives to this foundation, tending the sick, helping the poor, taking care of the street children of Moscow. The Grand Duchess also established a rent-free hostel for young women workers and students, a hospital, a clinic, a school for nurses and a soup kitchen. From what was to become in 1909 'The Convent of Mercy of St Martha and St Mary' the Grand Duchess and her helpers visited the poor, did housework, took care of children, bringing peace and happiness wherever they went. The Grand Duchess took part in all the work done, establishing a beautiful Convent garden, visiting even the poorest and most dangerous parts of Moscow. As she wrote in English to Tsar Nicholas in April 1909: 'I want to work for God and in God for suffering mankind'. She shone with the inner light of the soul at prayer and the crowds adored her. Her life was ascetic, all her personal fortune was devoted to good works and her only travels were pilgrimages to the holy places of Russia. In 1910 she was made Abbess of the Convent, which then housed 45 sisters. Writing of this in a letter in English addressed to Tsar Nicholas, dated 26 March 1910, in which she warned of Rasputin who in her opinion had clearly fallen into spiritual illusion, she said: 'I am espousing Christ and His cause, I am giving all I can to Him and our neighbours, I am going deeper into our Orthodox Church'. 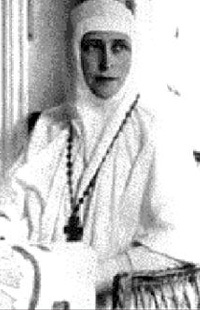 In the Convent she learned to practise the Jesus Prayer under strict obedience to the Convent's saintly spiritual father, Fr Mitrophan, of whom she had written in an English letter to Tsar Nicholas in April 1909: 'He is large, nothing of the narrow-minded bigot, all founded on God's boundless love and forgiveness - a true Orthodox priest keeping strictly to our Church'. The role of the Convent became particularly important during the First German War, when there were so many in hospital, so many to comfort. When the Revolution came in 1917, Abbess Elizabeth continued to live as before, attending church services, nursing the sick, caring for the poor. She turned down the offer of a Swedish Cabinet Minister to leave the country, saying that she wished to share the destiny of her country and its people. At first ignored by the Bolshevik regime, on the third day of Easter 1918 Abbess Elizabeth was ordered to leave for the town of Perm in the Urals. She left together with two nuns, Catherine and Barbara, escorted by Latvian Guards. From here she was moved via Ekaterinburg, where the Imperial Family, including her sister, were held in confinement, to the town of Alapayevsk. She arrived here on 20 May 1918. Abbess Elizabeth lived in captivity in Alapayevsk until the fateful night of 18 July 1918. It was the feast-day of St Sergius of Radonezh, her husband's namesday. On that night she, Sister Barbara, five members of the Imperial Family and a secretary, were taken to a mine and there martyred, first being blindfolded, beaten and then thrown alive into the mine-shaft. First to be thrown in was Abbess Elizabeth. As they seized her, she prayed, crossed herself and said: 'Lord, forgive them, for they know not what they do'. The murderers then tossed in hand grenades, but hearing the hymn,' O Lord, save Thy people...', they panicked and soon left. It is recorded that two of the murderers became insane shortly after their horrible crime. A peasant eyewitness reported that for hours afterwards he heard Abbess Elizabeth, mortally wounded, singing the Cherubic Hymn, hymns from the funeral service and hymns giving thanks to God and glorifying Him. These hymns continued into the following day. When in September the White Army liberated Alapayevsk and found the mine, they removed the bodies, including that of Abbess Elizabeth. They found her not at the bottom of the 200-foot deep mine-shaft, but on a ledge about fifty feet down. Only one body had been torn apart by the grenades. On the same ledge near the Grand Duchess' intact body there were two unexploded grenades and on her chest an icon of Christ. This was the icon of the Saviour Not-Made-By-Hands. This had been given to her, probably by the Emperor Alexander III, on the day of her reception into the Orthodox Church on 13 April 1891. (It is now kept in the Russian Orthodox Memorial Church in Brussels). She had been lying next to the Grand Duke John and it was found that she had attempted to dress his wounds before herself expiring. By order of the White General Admiral Kolchak, the bodies were all removed to the Cathedral in the nearby town of Alapayevsk on 1 November 1918. In 1919, the White Army, then in retreat, took the coffins with the bodies to Siberia and then in 1920 to China. The body of Abbess Elizabeth remained incorrupt. On 3 April that year the coffins were placed in St Seraphim's church in Beijing. However, from here they were removed to Palestine, thanks in part to the efforts of Elizabeth's elder sister, Victoria, Marquess of Milford Haven. On 15/28 January 1921, the relics were solemnly met in Jerusalem by Patriarch Damian, Russian and Greek clergy, members of the British authorities and innumerable Orthodox faithful. Here Abbess Elizabeth was buried in the church of St Mary Magdalene in Gethsemane. In 1888, before ever becoming Orthodox, the Grand Duchess had already expressed the desire to be buried here. This had been at the consecration of that very church, where she had gone with her husband, who was President of the Russian Palestine Society. 'Like a beautiful apparition, she passed through the world, leaving behind her a radiant trail' So wrote Abbess Elizabeth's early biographer, Metropolitan Anastasy. 'Together with the others who suffered for their homeland, she is both the atonement of the former Russia and the foundation of the Russia to come, which will be built on the relics of the holy New Martyrs... Not in vain had the voice of the Russian people proclaimed her to be a saint while she was still alive. As if to reward her for her glorious deeds on earth, and especially for her love of Holy Russia, her martyred remains were destined to rest near the very place of the Sufferings and Resurrection of the Saviour'. Abbess Elizabeth was canonised by the Russian Orthodox Church Outside Russia in 1981, which canonisation was later recognised by the Church inside Russia when it became free to do so in the 1990's. Holy New Martyr Elizabeth, pray to God for us! and published with the permission of the author. On the 1st of November 2014 we celebrated the 150th anniversary of the birth of our Holy Martyr Grand Duchess Elizabeth. She was born in 1864 in Darmstadt, the capital of Hesse-Darmstadt, in the family of the heir to the throne prince Louis, and princess Alice of Great Britain, Queen Victoria's second daughter. At the age of 20 Elizabeth married Grand Prince Sergey, the brother of Russian Emperor Alexander III, who later became General-Governor of Moscow. Thus by blood and marriage she had strong attachments to three different cultures. She spent 30 years in Russia and fell in love with this country and its people. Under the influence of her deeply believing husband, Elizabeth accepted Orthodoxy and confessed it throughout her virtuous life which eventually lead to Martyrdom for Christ. While celebrating the 150th Birthday of our Saint, we should remember her parents, who developed in her the qualities which were to flourish on Russian soil. Princess Alice had a remarkable and strong personality, she had gifts of love for her neighbour, willpower and intellect. In her youth, before her marriage, she was the main support for her mother in the days of her mourning for Prince Albert. She was not only Queen's carer and comforter but also her representative during various state occasions. Before her father's death she had been engaged to be married to the noble and good hearted prince Louis of Hesse, so her wedding was conducted during the time of mourning, in a simple and quiet way. Prince's Alice's new life in a small and not very rich German principality was predestined to be a life of self-sacrifice and service to her family and to her new people. Very soon Princess Alice was perceived by everybody in Darmstadt as a great benefactor to the poor and the needy. She established many charities and hospitals, often visiting the houses of the poor accompanied by her children. Her service to the nation was specially appreciated during the Austro- Prussian (1866) and Franco-Prussian (1870) wars. The Alice Hospital, which still bears her name, exists in Darmstadt to the present day. She did everything possible to bring local nursing skills up to the level of modern medical science. Her nurses were trained in Germany and in England, where the standards of nursing were higher. Alice was instructed by the famous expert in nursing, Florence Nightingale. A special area of her charitable work was dedicated to women in need. She established many women's societies - "Alice Societies" - which helped hundreds of women to acquire professional skills and to find jobs. This was a pioneering work for her time. Princess Alice showed many examples of charity to her children but perhaps the most memorable one was connected with their last family holiday visit to the sea-side resort of Eastbourne on the south coast of England. Even there she cared for the families of poor fishermen and organised charitable events with participation of her older daughters. That summer of 1878 Elizabeth was thirteen. In the winter of the same year a devastating tragedy happened. Her mother passed away, following her youngest sister May who had died several weeks earlier. Alice had caught diphtheria while nursing her children, sick with the same terrible disease. The image of a self-sacrificing Mother and a people's Princess stayed in the memory of two nations. The inscription and stain glass picture, dedicated to Alice's memory, can still be observed on the east window of All Saints church in Eastbourne, which she helped to build. (See our report here) Many charitable institutions and hospitals took her name, both in England and in Germany. The character and spirituality of Elizabeth were influenced by her mother's heroic example during her formative years spent between Germany and England. Many extraordinary features of Alice we can recognise also in her daughter Elizabeth, which came to fruition in her later days in Moscow; her heartfelt care for the suffering, self-sacrificing love to the sick and wounded, and her concern to help orphans and women in need. After the tragic death of her husband, who was blown to pieces by a terrorist bomb, in February 1905, Elizabeth completely dedicated her life to works of mercy. She headed the Moscow department of the Red Cross and replaced Sergey Alexandrovich in his position as a Chairman of the Imperial Orthodox Palestine society. She continued to provide active help on the front in the Far East (where the Russo-Japanese war still continued) organising mobile hospitals and often personally caring for the wounded and for the families of the slain. It is difficult even to list all committees and societies on which she sat, working to the point of exhaustion. In these years she conceived the idea of establishing a Convent of Mercy in Moscow. She prayed often in Orthodox Russian convents, going to pilgrimages and asking the advice of elders and church hierarchs concerning her project. The Grand Duchess knew the spiritual nature of Russian monasticism and intended to become a nun in her later years. But before this she wanted to serve people actively and to attract to this service many young women who shared with her the same burning love to suffering people. Earlier in her life in Russia Elizabeth had acquired substantial experience of Russian lay charitable activities and monastic service to the needy. She wanted to add to it the best from her knowledge of western practices. For this purpose she suggested to the Church authorities to revive the ancient institute of deaconesses adapted to the present day Orthodox needs.1 Most bishops of the Holy Synod of the Russian Church supported this idea but it was decided that it should be first discussed by the Council of the Church. This only finally took place in 1917-1918. In 1908 the Rule for a special convent – "Convent of Mercy" - where the Grand Duchess Elizabeth could realise the work of her life, was approved. The convent took the name of Martha and Mary, the sisters of Saint Lazarus, one of them representing the contemplative service to Christ, the other - the active service to neighbour [Luke 10:38-42]. The convent was opened in 1909 and Elizabeth Feodorovna became its Superior. Help to the poor, sick and orphans was offered here to such an extent that people started to call her "the White Angel of Moscow". "White"- because she and her sisters wore white and pale grey habits. As a white angel she used to appear in the most poor, dirty and degraded quarters of Moscow, usually accompanied only by one sister. The "Cross Sisters" of Martha and Mary were not nuns in the traditional sense, but they had a special rite of dedication, taking vows of service to the needy and one of obedience to their Superior. They were sisters of mercy but like nuns they lived together within the walls of the convent, where in church and in their cells prayer to God was constant. This did not stop, but even increased when she was arrested and finally executed by the bolsheviks on the 18th of July 1918, together with her faithful servant sister Barbara and other members of Romanov's family. The Martha and Mary Convent was a unique church institution in Russia in the beginning of the 20th century. It bore the imprint of the personality of its saintly founder and of other extraordinary and deeply believing people who worked with her. First of all we should mention the spiritual father of the convent, the priest Mitrofan Serebriansky. The success of the community depended on the careful choice of sisters and dedicated co-workers of the Grand Duchess. Not the least important was the generous financial, moral and administrative support given to the Grand Duchess by her close relatives in the Imperial Family. 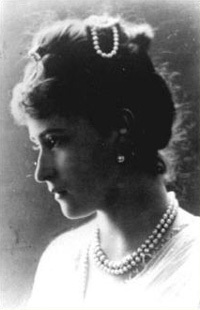 Despite Elizabeth's royal status and her terrible murder, the bolshevik authorities didn't dare to close the convent for another eight years, so high was its reputation in Moscow. In the year 1947 Alice's son prince Philip married the heir of the British throne princess Elizabeth, our present Queen, and received the title of Duke of Edinburgh. The memory of the Holy Martyr Elizabeth is respected and venerated by the British Royal House. Her sculpture was put above the entrance to the Westminster Abbey in 1998, together with other martyrs of the 20th century, which year was also the 80th anniversary of her Martyrdom. The solemn ceremony was attended by Her Majesty Queen Elizabeth and her husband Prince Philip. Her convent in Moscow is now fully restored and works actively as a charitable institution. In May 2014 it was given a monastic status with the name "Convent of Mercy". Holy Martyr Grand Duchess Elizabeth, pray God for us sinners! 1.The revival of monastic life within the Anglican Church started from the mid 1840s. By the 1870s there were many sisterhoods and convents which were combining worship with charitable work of every kind. Some women were taking vows of poverty, chastity and obedience, becoming proper nuns, some were living together in charitable communities. In Lutheran Germany in the 1840s and later in England, there was a revival of the early Christian institution of deaconesses. This movement was supported even by those Anglican bishops who opposed the idea of monasticism. Первого ноября 2014 года мы отмечаем 150-летие нашей святой Преподобномученицы Вел. Кн. Елисаветы Феодоровны. Она родилась в 1864 году в Дармштадте — столице Гессен-Дармштадского герцогства, в семье наследного принца, а позднее Великого Герцога Людвига IV и принцессы Алисы, дочери Британской королевы Виктории. Елизавета была немкой по отцу и англичанкой по матери. В 20 неполных лет она вышла замуж за брата императора Александра Третьего - Сергея Александровича Романова, в будущем - губернатора Москвы. Она прожила в России большую часть своей жизни, став русской по душе и по вере. Под благотворным влиянием своего глубоко верующего супруга Елизавета приняла Православие и исповедовала его всей своей праведной жизнью и мученической кончиной за Христа. Отмечая 150-ю годовщину рождения нашей великой Святой, мы не можем не вспомнить о её родителях, воспитавших в ней те добродетели, которые расцвели на ниве русского Православия. Мать Елизаветы, принцесса Алиса, была яркой и сильной личностью, наделенной дарами милосердной любви к ближнему, волей и умом. В юном возрасте она была главной опорой своей матери королевы Виктории, и особенно - в дни ее траура по безвременно ушедшему супругу Альберту. Она не только стойко справлялась с ролью сиделки и утешительницы, но и заменяла королеву на официальных государственных приемах. Еще до смерти отца она уже была обручена с Гессен-Дармштадским принцем Людвигом, благородным и добросердечным юношей. Ее свадьба прошла в обстановки траура, а венчание в комнатах загородней резиденции Осборн - аскетично и непритязательно. Так было положено начало её новой жизни в небольшом и небогатом немецком герцогстве, жизни, исполненной жертвенного служения ближним и своему новому народу. В Дармштадте принцесса Алиса очень скоро прославилась делами благотворительности, помогая больным и бедным. Она учредила многие благотворительные общества и больницы, часто сама и вместе со своими детьми посещала дома бедных. Ее жертвенность особенно проявилась в годы Австро-Прусской (1866) и Франков-Прусской (1870) войн. Она сделала все возможное, чтобы поставить дело по уходу за больными на уровень последних достижений медицинской науки. Ее медсестры стажировались в больницах Германии и Англии и переносили лучший опыт британского сестричества в Германию. Её консультировала знаменитая Флоренс Нахтингаль, эксперт по выхаживанию тяжело раненых. Специальное внимание принцесса Алиса уделяла такой области благотворительности, как помощь нуждающимся одиноким женщинам. Она была инициатором многих женских благотворительных организаций - «Обществ Алисы», целью которых было дать женщинам профессиональные навыки и помочь им в трудоустройстве. Для того времени это было поистине пионерское начинание. Принцесса Алиса показывала много примеров служения ближнему своим детям, но, пожалуй, лучше всего они запомнили последнее лето, проведенное с матерью на южном берегу Англии в курортном городе Истборн. Даже там она заботилась о семьях бедных моряков и организовывала благотворительные базары при участии своих старших дочерей. В это лето 1878 года Елизавете было 13 лет. Зимой того же года случилась трагедия. Принцесса Алиса заразилась дифтерией, ухаживая за своими больными детьми. Смерть ее младшей дочери, четырехлетней Мэй, подорвала ее силы, и через несколько недель она сама тоже скончалась, не справившись с болезнью. Характер и душевный склад Елизаветы сложился в ее юношеские, формативные годы, проведенные в Германии и Англии, под сильным влиянием ее матери. Многие экстроординарные черты характера принцессы Алисы мы можем распознать и в Елизавете; они проявились особенно ярко в последний период ее жизни, в Москве. Это и сердечная склонность к заботе о страждущих, и жертвенная любовь к больным и раненным, и особая озабоченность судьбой сирот и одиноких женщин. После трагической гибели в феврале 1905 года от рук террористов ее благоверного супруга Елисавета полностью посвятила себя делу христианского милосердия. Она возглавила Московское отделение Общества Красного креста и заменила Сергея Александровича на посту председателя Русского Православного Палестинского Общества. Елизавета Федоровна продолжала активную деятельность по оказанию помощи фронту на Дальнем Востоке, снаряжала походные госпиталя и лично заботилась о раненных и о семьях погибших. Трудно даже перечислить все благотворительные комитеты и общества, которым она отдавала всю себя без остатка. В эти годы у Елизаветы Федоровны зародилась идея создания Обители Милосердия. Она часто молилась в монастырях и просила совета у опытных старцев и церковных иерархов о том, как ей осуществить задуманное. Великая Княгиня глубоко поняла духовную природу русского монашества и готовилась сама принять монашеский постриг позже, на склоне лет. Но прежде ей хотелось все свои силы отдать активному служению ближним и привлечь к этому делу многих молодых женщин, горящих той же любовью к обездоленным. В период своего замужества, в роли жены брата Государя и Генерал-Губернатора Москвы, она приобрела немалый опыт работы в светских благотворительных организациях. Совершая поломничества по русским монастырям, она узнала многое о монашеском служении ближним. Не забывала она и о том опыте западной благотворительности, который она получила в годы юности, и хотела использовать и его в своей новой обители. Она предложила возродить ранне-христианский институт диаконисс, приспособив его к нуждам Русской Православной Церкви. Эту идею, хотя она и была поддержана большинством в Синоде, было решено сначала поставить на обсуждение на Всероссийском церковном соборе, который должен был состояться в 1917-1918 годах. В 1908 году убыл утвержден устав особой обители - «обители милосердия», где Великая княгиня Елисавета Федоровна и смогла реализовать дело своей жизни. Обитель получает название Марфо-Мариинской в честь сестер праведного Лазаря, одна из которых, Мария, олицетворяла созерцательное, молитвенное предстояние Христу, а другая, Марфа, — деятельное служение ближним [Лука 10:38-42]. Марфо-Мариинская обитель милосердия в Москве открылась в 1909 году, и Елизавета Федоровна стала ее начальницей. Помощь бедным, больным и сиротам осуществлялась здесь в таком масштабе, что за Елизаветой Федоровной закрепилось имя «Белый ангел Москвы». «Белый» - потому что она сама и ее сестры всегда носили светлое облачение. Крестовые сестры Марфо-Мариинской обители не были монахинями в традиционном смысле, но проходили особый обряд посвящения, принимая обеты служения ближним и послушания начальнице. Они были сестрами милосердия, но, подобно монахиням, жили совместно в стенах обители, где в храмах и келейно возносилась непрестанная молитва Богу. 18 июля 1918 года Елизавета Федоровна вместе со своей келейницей Варварой и другими ни в чем не повинными членами семьи Романовых была живой сброшена в шахту близ города Алапаевска. Марфо-Мариинская обитель была уникальным церковным организмом для России начала 20 века. Она несла на себе отпечаток личности ее святой основательницы и других незаурядных и глубоко верующих людей, трудившихся в обители. Прежде всего, нужно упомянуть духовника обители отца Митрофана Серебрянского. Успех обители определялся во многом строгим отбором сестёр и сподвижниц Великой княгини. Немалое значение имела и щедрая финансовая, моральная и административная поддержка, которой пользовалась Великая Княгиня как ближайшая родственница Императорской четы. Опыт этот был абсолютно успешен и получил всеобщее признание при жизни Елизаветы Феодоровны. Даже после ее мученической кончины большевистская власть не решалась закрыть Обитель еще в течение почти 8 лет, так высоки были ее заслуги перед Москвой. Восстановление обители началось в 1992 году, а в 2014 году она была преобразована в ставропигиальный женский монастырь с сохранением особого уклада Обители милосердия. В 1947 году сын Алисы, принц Филипп, сочетался браком с наследницей Британского престола принцессой Елизаветой, нынешней королевой Великобритании, и получил титул Герцога Эдинбургского. Память Святой Преподобномученицы Елизаветы свято хранится Британским Королевским домом, и ее выражением стало помещение в 1998 году скульптурного изображения Святой Елизаветы над входом в Вестминстерское аббатство, в одном ряду с другими мучениками 20-го столетия. Этот год был ознаменован 80-летием ее мученической кончины. На торжественной церемонии открытия памятника присутствовали Ее Величество королева Елизавета и ее супруг принц Эдинбургский. Святая Преподобномученица Великая Княгиня Елисавета, моли Бога о нас, грешных! On 17th of February (4th old style) we pray for the repose of the soul of Grand Duke Sergei Alexandrovich the husband of Holy Martyr Elizabeth who was assassinated on that day in the year 1905 by terrorist Kaliaev, a member of the Socialist Revolutionary party. Below we publish two fragments from the Diary of Grand Duchess Xenia Alexandrovna and from the memoir of Grand Duchess Maria Pavlovna, the niece of Grand Duchess Elizabeth, who lived with GD Elizabeth an GD Sergei all her childhood. 4 February, St Petersburg. Poor Uncle Sergei was killed in Moscow this Afternoon! It is simply terrible - awful, sad and shameful. he was riding out in his carriage when some swine shrew a bomb and he was killed instantly - blown to pieces! No it is simply not possible! Poor Ella, how desperately sorry I am for her, what unimaginable grief, and there all on her own. I so want to go to her, be there with her, the poor thing, at this terrible time. At 5.30 we went to Tsarskoe and found everybody gathered, Alix of course wants to go, Mama too, but they were dissuaded - it's just too great risk,although it seems awful to leave poor Ella quite alone it's too unbearable to contemplate! Suddenly we heard a terrible explosion which rattled the windows. The silence that followed was so oppressive that for several seconds we could not move or even look to each other....My aunt ran out of the house, the cloak thrown over her shoulders... She rushed to where the body was lying in the snow. She gathered fragments of dismembered flesh and placed them on an ordinary army stretcher which had been hurriedly fetched from a nearby workshop. Soldiers from the barracks opposite covered the body with their greatcoats; then, lifting the stretcher onto their shoulders, they carried the corpse to the Chudov monastery and took it into the church, next door to the palace entrance where we were staying. ... the church was filled to bursting; everyone was kneeling, many were in tears. ... My aunt was kneeling by the stretcher. Her bright dress looked out of place against the modest garments surrounding her. I did not dare look at her. Her face was white, her expression one of extraordinary, utterly striking, immobility. She was not weeping, but the look in her eyes made an expression on me that I will never forget. The local newspapers of the period reveal that as a child, our Saint visited East Sussex in the year 1878. It happened in this way. Queen Victoria was becoming increasingly concerned about the health of her second daughter, Princess Alice, the Grand Duchess of Hesse and mother of Saint Elizabeth. As the Grand Duke Ludwig of Hesse had little spare money, the Queen arranged for the couple and their children to have a restful summer holiday in Eastbourne paid for by herself. Princess Alice arrived by train with her husband and children and went straight to High Cliffe House, number 25 on Grand Parade, where they stayed. This was owned by the 7th Duke of Devonshire who had laid out most of the seaside area of Eastbourne. Later the Hessian Royal Family lived at his beautiful 18th century residence called Compton Place, a little way inland. The first few weeks of the holiday seem to have been quiet, the papers only mentioning a visit paid by the Grand Duke and Grand Duchess to Hastings, where they saw the pier (now demolished) at St Leonards-on-Sea. However this period of rest was not to last because Princess Alice always liked to involve herself in charitable and philanthropic activities wherever she went and to teach at least her older children to do the same. Such memories must have impressed themselves upon her children even though their mother died when they were so young. On 6th of August, she and her children watched a festival and games organised for the poorer schools of Eastbourne. Alice's son, Prince Ernst Ludwig, who was ten, joined in the races and gave pocket knives as prizes. On the same day Princess Alice presented prizes at Eastbourne College. Afterwards, the local newspapers expressed their gratitude to the princess and her family for drawing Eastbourne's attractions to British holiday makers! The next social event, the Eastbourne Flower Show on 20th August, was attended only by the Royal children, as their mother was unwell but on 27th, the entire family opened and attended a Grand Bazaar in aid of the building of All Saints Church in a poor quarter of the town. Here is the first specific mention of the presence of Princess Elizabeth, who was fourteen at the time. Also present was Alix, later the New-Martyr and Empress Alexandra Feodorovna, who was only six. All Saints Church was not consecrated until the following year and during their stay the family worshipped at Christ Church in the fishermen's quarter. Here the Grand Duchess and her children visited the Day and Sunday Schools of the parish and the poor in their homes. Princess Alice's stay is commemorated in a window above the altar which was completed in 1884. By September, the Royal visitors, had become extremely popular and well-known in Eastbourne and on the 3rd the newspapers note with satisfaction that they were prolonging their stay by a fortnight. Sadly, Princess Alice died in the same year, after her return to Damstadt. She contracted diphtheria from nursing her children who had caught the terrible disease. She died on 13th December though all but one of the sick children survived. In 1879, the children again stayed in Eastbourne, this time for their own health's sake, but it seems to have been a visit with no public engagements at all. In 1882 the foundation stone was laid of the Princess Alice hospital in Eastbourne funded by her sisters and built in memory of her happy holiday. The hospital survived until 1996.